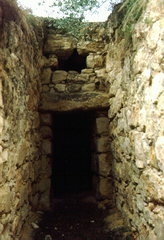 Large tholos tomb with a long, built dromos. The chamber is built in the ecphoric system. It is dated to the Late Minoan III period. The tomb was excavated in 1961 by the archaeologists K. Davaras and N. Platon; it had been looted, possibly in antiquity.